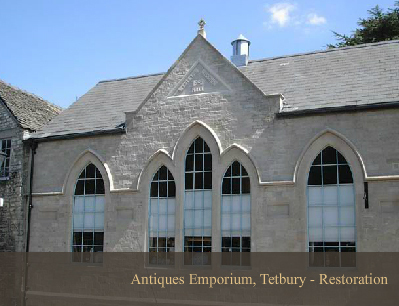 ‘Conservation’ and ‘Restoration’ are terms popularly used in connection with repairs carried out on older and often listed buildings and structures. Frequently, they are thought to mean one and the same, but do they? So what do they mean and where do they differ? ‘Conservation’ embraces all essential measures taken to ensure the long-term well being and survival of a building. The decayed stone is only replaced as a last resort. Some measures can sometimes involve sympathetically undertaking mortar repairs using a traditional lime mortar, stone replacement to match the original detail and even partial demolition where the future of a building is at risk. All the above can only be carried out provided that Listed Building Consent is obtained where it is applicable. ‘Restoration’ on the other hand involves measures taken to reverse often poorly executed past alterations in attempts to put back or ‘restore’ features thought to have been part of the original building. Unfortunately, much misinterpretation has taken place during this process of change and ‘conservationists’ often regard ‘restoration’ unfavourably due to the many schemes that have changed original features beyond recognition. We are conversant with the requirements of Conservation Officers and Conservation Architects, and enjoy working with them on challenging projects and look forward to the continuing expansion of our Conservation Division’s activities, thus playing our part in maintaining the well being of our built heritage. Should you require any advice on the problems you could be facing with your building or buildings under your care, we shall be very pleased to meet with you on site to discuss remedial or preventative action. Our aim is to give sound common sense advice, a reliable service and good value for money.